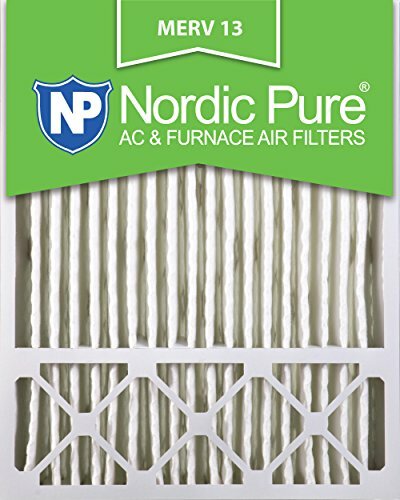 Nordic pure’s 5" Lennox x6673_x6675 replacement merv 13 rated air filters are the newest filters made by Lennox with a slightly decreased height and width, but the same ACTUAL depth of 4 3/8". this filter is a new standard size that will fit both old and new systems. As always, we ask you to measure your filter housing to ensure the proper fit. 5" Lennox x6673_x6675 replacement merv 13 rated air filters are made of electrostatically charged synthetic materials that are ideal to reduce airborne contaminants in your home or business. Each time air passes through a Nordic Pure pleated furnace filter, airborne dust, pollen, mold spores, pet dander, smog, dust mite debris, and Tobacco and fireplace smoke are captured and removed. Merv 13 air filters are comparable to air filters with the mpr rating of 1900-2200, fpr rating of blue, and apr rating of diamond. Particles in indoor air are measured in microns; for scale, a human hair is about 70 microns wide. Each Nordic Pure 5" merv 13 air filter will capture more than 90% of 1.0-10.0 micron contaminants and up to 75% of .30-1.0 micron contaminants. The effective life of your air filter depends on the inside and outside conditions in which you live. We recommend that you change your air filter every 3-6 months to maintain maximum efficiency and indoor air quality.